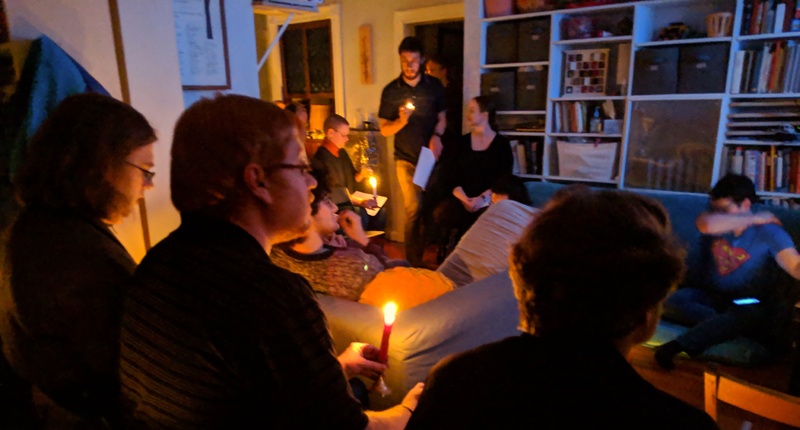 Last night we hosted the Boston Secular Solstice, which I wrote about planning a couple months ago. It felt like it went really well! Several people told me it was their favorite one we've had in Boston. The past few years we've been at the MIT Chapel. It's a really nice space for this sort of event, but you need more people for it to feel right. Comfortably full is a much better feeling than spread thin. This year we decided to have it at my house, and I was thinking we might have ~20 people. 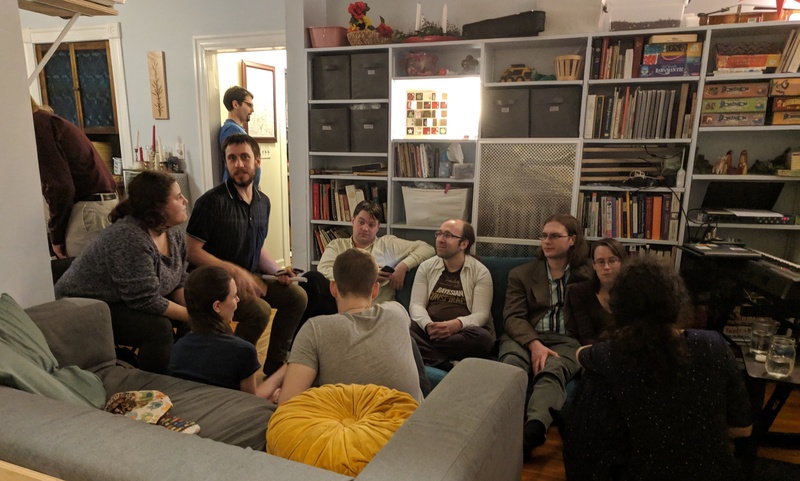 We ended up having ~40 people, which was a lot. There were empty seats, but only ones that had basically no ability to see the projector. At the beginning I told people how to follow along on their phones if they couldn't see well, but I'm not sure whether that was useful. It's back down now, though I still need to spackle the holes. Helpful things about having your own place! The overall structure we followed was about 20min of people arriving and getting settled, with snacks, and then a first half of relatively light things. 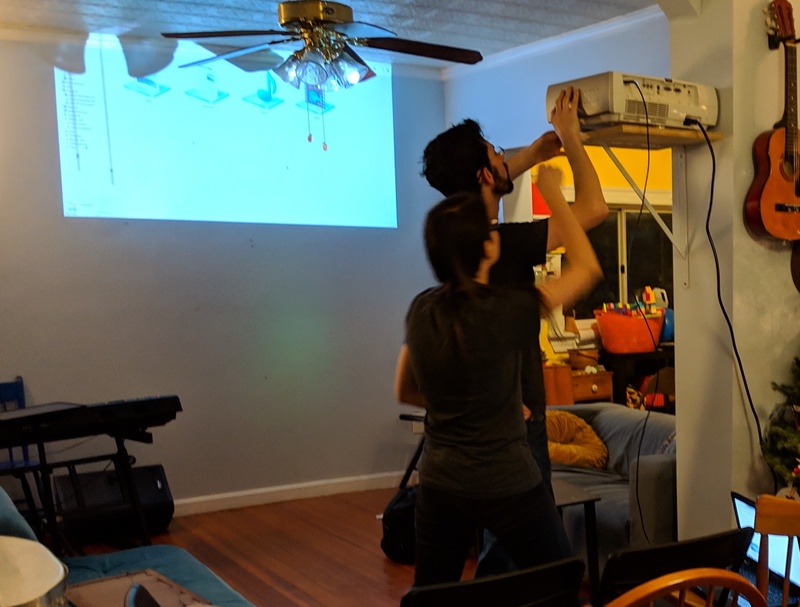 We took a break for intermission, with a dessert potluck, and then when we came back we did progressively darker things culminating in a reading of Beyond the Reach of God and singing Brighter than Today. We ended with a few more songs and one more reading, and then people hung out for ~2hr until I pushed the stragglers out so we could go to bed. Introduction to Why Did the Sun Shine? Introduction to Why Does the Sun Shine? Introduction to Why Does the Sun Really Shine? Ray tried to convince us to get big tall candles ahead of time, but I liked the idea of using a quirky collection of weird ones I had. In retrospect the weird ones did really poorly with lighting candles from each other, and tall ones would have been a lot better. Being in a place where we could comfortably hang out afterwards was great. Lots of interesting discussions. Overall, I really liked having candles, which is something we weren't allowed to have at the MIT Chapel. Of ~40 people, only three needed parking. Which was good, because I only could park four! With enough notice I probably could have gotten parking consideration, which is where the city suspends residential parking enforcement around your house because you're hosting something. Every year I wish we could have the music settled farther in advance so we'd have time to actually rehearse. Several people led songs where I was accompanying them completely cold, and as often happens with open signups not everyone who volunteered could carry a tune. Relighting the candles took long enough that some people got bored, and it would have worked better if we started Brighter than Today while people were still passing the light around. Past solstices I've played a piano, which has meant having my back to the audience. This time I played keyboard, which was so much better. I really like being able to see people, and it also makes it easier for people to follow me if I'm leading the singing. There are a surprisingly large number of versions of Brighter than Today, and the one we've landed on is kind of an unusual one. Ray is working on standardizing this some, and I'll look back next year to see what this is like. A lot of these songs have tunes that are pretty complex, and this was after trying to pick simpler ones than in past years. Combined with our historical difficulty finding strong songleaders this has been tricky. Filks of common songs are one way to handle this (the Paleolithic version of Why Does the Sun Shine?, the pandemic version of Sinner Man, various reworded Christmas carols we've done at times), as is composing new songs with simple melodies (Chasing Patterns). This is a similar set of constraints (with less tolerance for filks) that led to praise music (examples), and those songs are generally reasonably easy for people to pick up. I looked at what it would take to get this program (and past Boston programs) onto the Secular Solstice Resources page, but after getting the dependencies installed and starting to add something it seemed like much more typing than I was up for. Other people probably have better pictures than I took? None of mine came out especially well. Starting right in with Why Did the Sun Shine would have been better in terms of feeling, but we didn't think enough people knew the tune. Turns out we were wrong! Taymon did a huge amount of work, which was critical for this to go as well as it did. Glad to see how this came out, and thanks for the writeup! When I have gotten to do candles, the way I do it FYI is to have the first candle lit during Brighter Than Today (with the match struck on the line "till she saw the spark of light") and then have the candles get lit during the song, which leads to nice effects of a) nobody being bored, and b) the song growing brighter over the course of it. Her Mysteries! I love that song and keep hoping it'll catch on, but never managed to make much headway. What was people's feedback on it? Also, curious if there's a polished recording out there somewhere? I tried googling and failed somehow.